How Joanna Hershon fell into the rabbit hole of German Jews in the Wild West. Berlin, 1863. After two Jewish girls sit for a portrait painter in their father’s Berlin parlor, Eva—the youngest of the two—begins a secret and illicit affair with the mercurial (and gentile) painter, which results in tragic consequences, not only for Eva, but also for her family. Tortured by her secret, in addition to her bottomless grief, she quickly marries the charismatic Abraham Shein, a successful merchant living in Santa Fe, New Mexico, who has returned home to Berlin, in search of a bride. They leave Berlin and its ghosts for an unfamiliar life halfway across the world, traversing the icy waters of the Atlantic and the rugged, sweeping terrain of the Santa Fe Trail. Though Eva’s existence in the rough and burgeoning community of Santa Fe is a far cry from her life as a daughter of privilege, she soon begins to settle into the mystifying town, determined to create a home. But this new setting cannot keep at bay the overwhelming memories of her former life, nor can it protect her from an increasing threat to her own safety that will force Eva to make a fateful decision. My journey of writing this novel began with a friend saying, “My ancestors were Jewish cowboys.” I was intrigued by the statement and then really intrigued when he continued to explain that his great-great-grandmother was currently a famous ghost who haunted a Santa Fe hotel. And so, I didn’t set out to write about a Jewish woman; however, her being Jewish was one of the main reasons my interest was piqued. I’ve long been fascinated with the Diaspora, how Jews are simply everywhere, and this story seemed to embody many of my interests—the nineteenth century, the American West, exile, marriage. Oh, these categorical questions always stump me. Where does it all end and begin? At the risk of being too professorial or opaque, I’m interested in the question as a question. But The German Bride can certainly be read as a Jewish book, and I’ve had fascinating responses to the book that center around the question of Zionism. However, it is also a book about desire and exile and longing, and these are certainly, to my mind, universal issues. As I mentioned earlier, the moment it began was hearing about my friend’s family. But he knew little else besides that original statement. What interested me and kept me researching and engaged in the idea was the mystery of how a woman found herself across the world from all that she knew and treasured. Since my friend’s great-great-grandmother was rumored to be extremely unhappy and mercurial, I started investigating the causes of potential sorrow. I should mention that my friend’s family story was only a springboard, an original spark. It’s what led me down what I think of as the rabbit hole of German Jews in the Wild West. I suppose I’d like all readers to broaden their ideas of who is Jewish, and what that means, and to also experience the American West in, hopefully, a new way. I hope readers will appreciate the contribution that Jews made in Santa Fe and elsewhere in nineteenth-century America. Also, I don’t want to spoil the book for anyone, but I’ll just say that the last moment of the book—who is there, and the questions they raise—is very important to me. Sophie’s Choice by William Styron comes to mind right away. When I read it for the first time, years ago, this novel seemed to contain everything I ever needed in a book. Certainly there is a commitment to exploring obsession among many other great themes. In Sophie’s Choice, Sophie is not Jewish, but her lover Nathan is. They are both seen as glittering and beautiful and terrifying—worthy objects of obsession—but ultimately they act as teachers for the narrator, who is pulled into their complicated and ultimately tragic lives. Because this is a story about, among other things, the Holocaust, that the three main characters are both Jewish and non-Jewish, and that they come from totally different backgrounds, is not incidental. What kind of books would you like to see written for Jewish readers (or readers who are just interested in Judaism). Are there voids or topics you’d like to see tackled? Hmm. The first thing I thought was that I’d like to read more voices and perspectives on being Israeli because the nature of the place and its people is endlessly fascinating and complex. What a great question. I feel Jewish when I think about my grandparents, or about what I want my children to understand as they grow up, or when I try to define questions such as this one. I am just starting another novel, which I am excited about. I don’t think readers will be seeing it any time soon, but I will say that it is about class and identity, friendship, money, family… and that, though I have returned to the twentieth century, Jewish identity is again popping up in my work. What question do you wish a journalist would ask you, and what is your answer? Fantasy Question: Why do you think the New York Times allowed its reviewer to include such lazily stereotypical Jewish references (Oy, kvetch, etc.) in her review of The German Bride? My answer: I’m not sure, but I was disappointed, especially because I wish the reviewer had spent more time delving into the complex, and often compelling, questions she raised. On a more positive note, the paperback edition of The German Bride is coming out in March and, in the back of the book, there is an interview with a fabulous Jewish writer, Elisa Albert, whose questions were wonderful and thought provoking, as were these. Thank you. 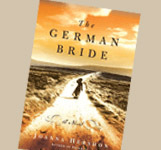 Joanna Hershon (BA, University of Michigan; MFA, Columbia University) is the author of three novels: Swimming, The Outside of August, and The German Bride. She has been an Edward Albee Fellow and a Guest Writer at Porter-Gaud in Charleston, South Carolina. Her writing has been included in the 2008 literary anthology, Brooklyn Was Mine, short-listed for the 2007 O. Henry Prize Stories, and has appeared in One Story, Post Road, Five Chapters, and the Virginia Quarterly Review. She lives in Brooklyn with her husband, the painter Derek Buckner, and their twin sons.